Update: Since first writing this article, Uber & Lyft are now fully legal everywhere in South Florida, including Broward County. We have updated this piece with the most accurate information as of 2017. If you’re cruising from Miami or Fort Lauderdale (Port Everglades), there’s a good chance you will use a taxi to get to the port. Now there is an alternative to using a cab that can be cheaper and more convenient. You’ve likely heard about Uber and Lyft, but most people haven’t used them before. These companies are known as ride-sharing services. Essentially, they allow anyone to drive their own car as if it were a cab. Drivers sign up, undergo a background check, and then can earn money providing rides around town. For passengers (in this case people going to the cruise port), the entire process is run through an app you download on your smartphone. The app will tell you where the nearest available ride is, keeps track of the fare, and is even linked to your credit card for payment. You simply download, enter your payment information, and request a ride when you’re ready to go. Why would people prefer to use a service like Uber or Lyft instead of a taxi? For one, these services can be cheaper than using a cab. Furthermore, since drivers are rated by passengers after each ride (and can be booted out if their reviews are too low), the service received is often more pleasant. Most importantly, it’s convenient. A ride is never far away and can be summoned with the click of a button. According to the Miami Herald, Uber has 10,000 drivers in Miami-Dade County. Uber and Lyft are now available everywhere in South Florida. As of May 2016, the Miami-Dade County Commission voted to legalize ride-sharing companies like Uber and Lyft. In late 2015, Broward County (where Fort Lauderdale-Hollywood International Airport is located) saw Uber and Lyft return to the area. The companies had left due to rules and regulations it felt were too tight. However, strong public demand hounded county commissioners, according to Sun-Sentinel.com. After loosening the rules, the ride-share companies returned. The map below shows where you can be picked up by either Uber or Lyft. You can be dropped off anywhere you like. If you are sailing out of the Port of Miami, you can use a ride-share service to get you there cheaply and quickly. Below we have a breakdown of the rates you can expect to pay for each service to get to the Miami cruise port. Keep in mind that your cost is per ride, not per passenger. As well, both companies have different levels of premium services. The prices shown below are for the most basic offerings. UberXL and LyftPlus offer larger vehicles for more passengers for a slightly higher cost. Cruise passengers will likely be most interested that a ride from the Miami airport to the cruise port costs about $16, compared to a $27 flat fee for a taxi. If you plan on staying in the area, you can also look for a hotel with a shuttle to the Miami cruise port. You’ll find the prices for getting to Port Everglades in Fort Lauderdale below. Just like getting to the Port of Miami, the prices below are for the most basic service and are for the entire ride, which is the same regardless of the number of passengers. A taxi from the Miami airport to Port Everglades would run approximately $75, considerably more than Uber or Lyft. 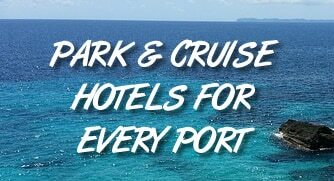 If you plan on staying in the area, you can also look for a hotel with a shuttle to the Port Everglades cruise port. Please let us know what it would cost two seniors to be taken from Naples, Fl. to the Port of Miami and returned 10 days later? Uber and Lyft aren’t really designed for long trips like that. It’s more like a taxi where it takes you around town. We’d suggest contacting a local transportation company to see if they can give you a ride. Sure. You might want to split that into two cars since it’s going to be a big group.